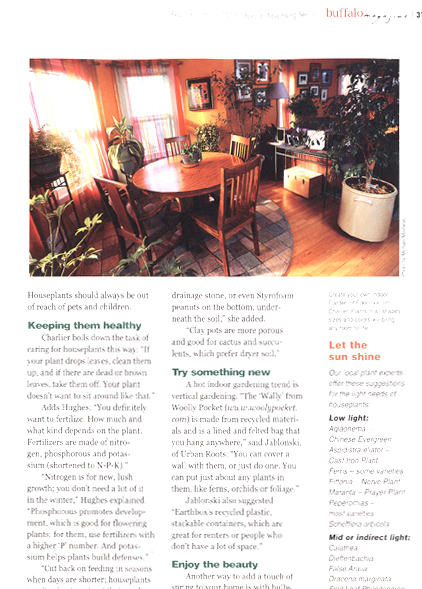 Okay, I don't have a dedicated plant room, but it's the room with the most windows, so it wins – and it was photographed for this article on houseplants. Writer Jana Eisenberg, freelancing for The Buffalo News, was looking for interview subjects. I'm no major houseplant aficionado, I have about 40 or so that I keep hobbling along though winter, increasingly bedraggled-looking each week, until I can drag them outside for the summer. A half-dozen or so are odd-looking tropicals that are part of our Harry Potter Garden. Any advice I had was of the practical end: Cut off dead & dying leaves -- even if the plant looks sparse, it'll look healthier; If you don't have windows where you need them – north or south – any window will do – plants adjust. Other things I've learned: invest in those plant caddies with wheels for heavier plants; estate sales and garage sales are good places to find larger & unique planters at good prices; even established houseplants have to be "hardened off" by being taken outdoors–in shade–for a week or more before they get put where they'll spend the summer; and finally, and most importantly, don't clue your spouse into how much you spend on houseplants. Much smarter people than I had better advice. 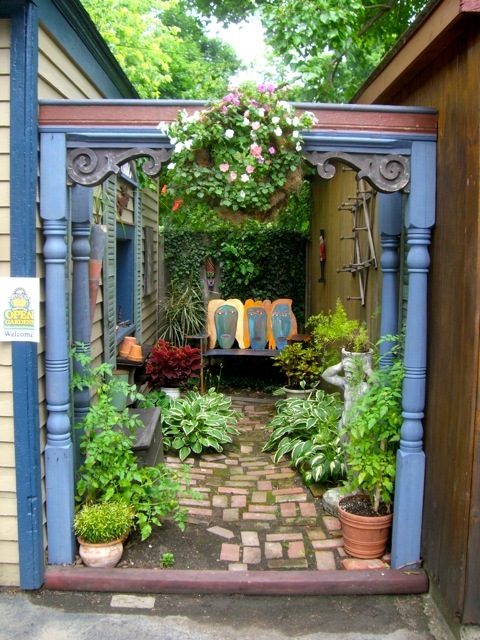 Patti Jablonski, manager of Urban Roots Community Garden Center suggests trying different containers like Woolly Pockets hanging on walls for planting. 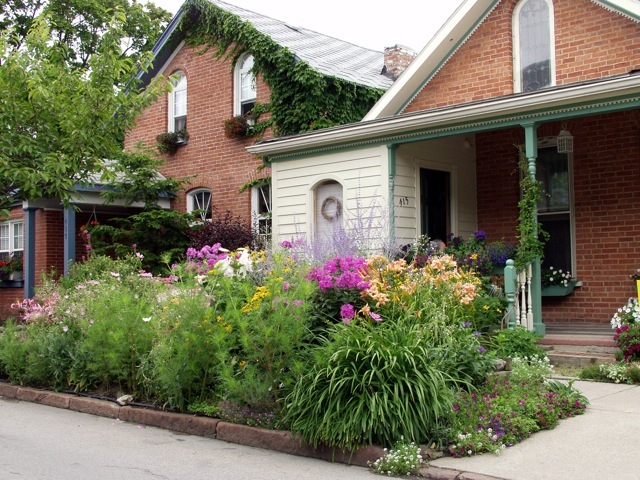 Julie Hughes of The Buffalo & Erie County Botanical Garden has the best advice–know the conditions of a plants potential environment, and plan to buy accordingly–and to your budget (personally, I buy plants just 'cause I like 'em). She also suggests regular & controlled fertilizing (I'm a failure here too). Julie should really be a blogger! Or at least start a blog for the Botanical Gardens. There are plenty of great indoor growers I know of in the area that would have made better interview subjects than myself. Former chair of Garden Walk Buffalo Arlan Peters has a glassed-in back porch with a glass garage-like door that comes down to make the porch a greenhouse in the winter. He'd have had some great tips. Garden Walk committee member Bob Fink grows from seed many of the annuals used in the hanging baskets & containers around Allentown (or he used to, at least). 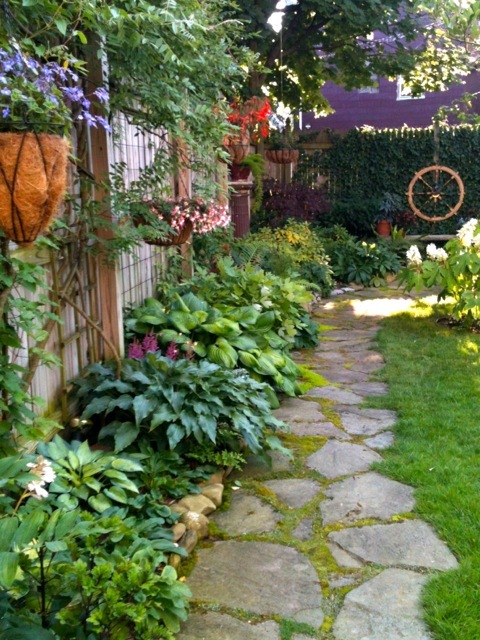 Gardening While Intoxicated & Garden Rant blogger Elizabeth Licata knows more about forcing and growing bulbs throughout the winter than any one I've ever met (she grows hundreds of 'em). 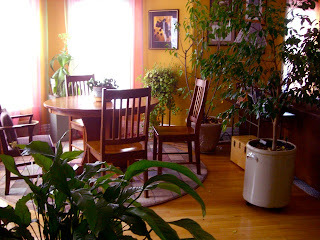 Many have more and know more about houseplants than myself. But my "plant-room" looks good in pictures! 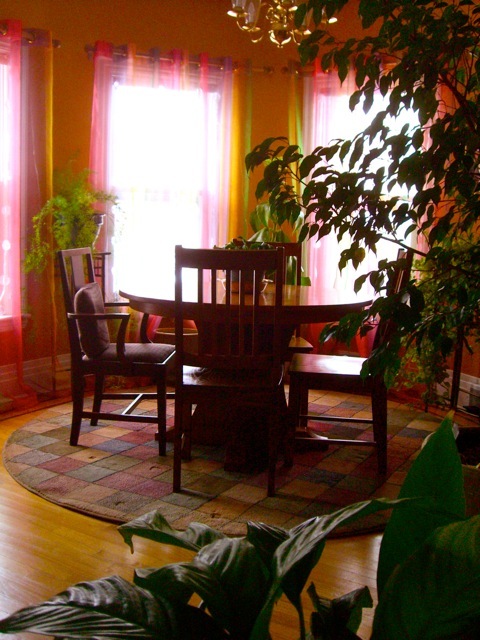 That room looks great with all your plants. I'm always trying to fit one more in myself. Nice your plant room got the nod. You have quite a few too.